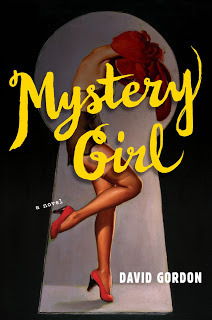 Thanks to TLC Book Tours, we're pleased to present a review for Mystery Girl, a new mystery novel by David Gordon. Make sure to check out the rest of the tour stops to see other reviews! I was hooked on Mystery Girl from the very beginning. when we meet failed novelist Sam Kornberg, whose life is very quickly going to go from average to very ridiculous, he just doesn't know it yet. He accepts a seemingly ridiculous job as an assistant to private detective Solar Lonsky, as a last ditch effort to prove to his estranged wife that he can be a responsible grown-up, too. What starts out as a simple surveillance job, reporting the actions of a mystery woman to Lonsky, turns into something far more complicated than you'd expect. To explain much more is to ruin some of the ridiculous twists and turns poor Sam's story takes, but suffice it to say, he's in over his head a whole lot. I enjoyed this book far more than I thought I would, actually. I accidentally burned myself out on mysteries a little bit, reading far too many formulaic, kind-of boring stories, and despite the intriguing summary (which I had honestly forgotten by the time I got around to reading it for the tour), I was worried that this was going to turn out to be the same. I was pleasantly surprised when Sam's narration was witty and wry and self-deprecating, and when not all was as it seems at first glance. We read most of the book from his first-person perspective, with just a few brief chapters coming from someone else's view, usually in the form of a letter or some extended dialogue. While there was one major plot point that I'd half-guessed, everything else came as a surprise, which was a great change. This book also had some insightful things to say about art, mental illness, writing, relationships, love, and more. For as witty and fast-paced and borderline absurd the story was, you'd flip the page and find a very poignant passage that may move you in a way you didn't expect. Don't underestimate this book based on its genre and pin-up girl cover, as there's something special about it despite the wacky plot. I will say that the plot does get kind of convoluted by the end and I had to keep reminding myself about plot points or minor characters, but I also feel like, since you're reading most of the book from Sam's perspective, that's not such a bad thing, as he spends a lot of the time being hurtled from one absurd situation to the next. Also, the story contains violence, cursing, and some sexual situations so is recommended for mature readers.